Free shipping. Buy direct from HP. See customer reviews and comparisons for the OMEN by HP Sequencer Keyboard. Upgrades and savings on select products. Switch to optical. Strike faster. Maneuver at the speed of light and gain an edge over your competition with industry-leading optical-mechanical switch technology. Built for gamers, with customization and durability in mind. 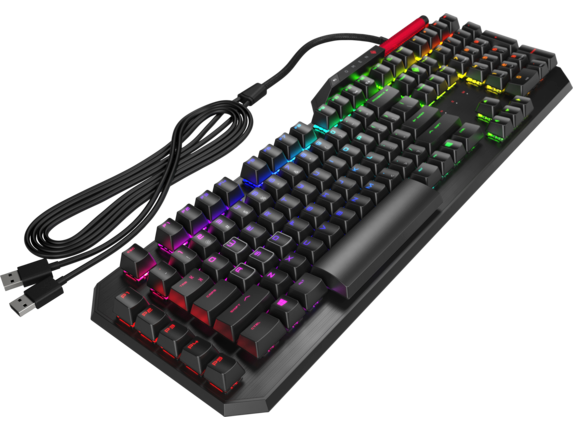 Individually backlit keys offer up to 16.8 million RGB colors to choose from with unique effects, all customizable from OMEN Command Center. Optical-mechanical Blue switches enable a 0.2 ms response time—10 times faster than traditional mechanical switches—plus a 70 million click lifetime. The HP OMEN Sequencer Gaming Keyboard reflects your personal style and enhances your technique with individually customizable RGB backlit keys with up to 16.8 million colors to choose from. Simply connect to the HP OMEN Command Center to access custom colors and effects to tailor your style to your optimal gaming experience. Besides incorporating personal style, the backlit keys also give you the competitive advantage you never thought you needed. Create your own shortcuts utilizing backlit color-coding to react quickly to threats and knock out your competitors. Think of it as muscle memory for your gaming, always guiding you to the optimal strategy and best plan of attack. Respond 10 times faster than other gamers with traditional mechanical switches, thanks to the HP OMEN Sequencer’s optical-mechanical blue switches registering each move with superior accuracy and agility. In just 0.2 milliseconds your keys can respond to launch a critical attack on your enemy and score you some serious gaming cred. Optical keyboards like the HP OMEN Sequencer, detect key taps by recognizing changes in light, prompting a quicker response than traditional keyboards that depend on pressure to register a command. In the heat of the moment gamers can start to abuse their keyboards to initiate technical strategies, but with an optical system you can have some mercy on your keys and improve your strategy. Don’t let a stiff keyboard be the reason your game is lagging. Make the switch to optical. Designed specifically for high-performing gamers, the HP Sequencer keyboard responds to your commands quickly and accurately with optical technology. Prefer to game with the tactile experience of mechanical keys? The HP OMEN 1100 Gaming Keyboard employs the same craftsmanship and design from HP® with agile mechanical keys. The HP OMEN Sequencer doesn’t stop at gaming. The gaming-optimized setup is ideal for serious wins, but this keyboard is unique in its ability to adapt to basic computing needs in addition to outstanding gaming capabilities. 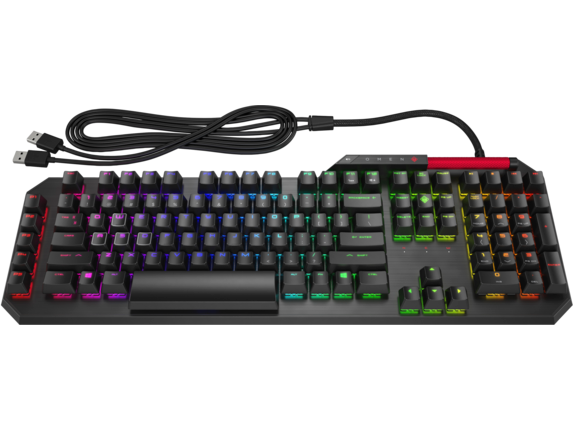 If you want to up your gaming accessory collection, and need a gaming keyboard that can tackle any task, fantasy or otherwise, the HP OMEN Sequencer is up to the challenge. Whether you’re working on RL monotonies or owning your competition, this keyboard outperforms all others. The HP OMEN Sequencer is designed for durability. You can expect this keyboard to be your favorite accomplice thanks to its reliable and resilient construction. The 70-million-click lifetime ensures you won’t lose power during an epic battle. You’ll always be at the top of your game. At just 1.83 lbs, the HP OMEN Sequencer gaming keyboard allows you to take your gaming talents wherever you go. Whether you’re a competitive gamer heading across the globe for a tournament or you just enjoy collaborating with friends, you’ll feel confident knowing you can depend on consistent keyboard ammunition wherever you take your talents.